The spiritual journey is primarily inward. Because of this, no vacation will give you the answers, nor will you become enlightened the moment you step into a Buddhist monastery. Having said that, some places that have been sacred for centuries, or even millennia - have an uncanny ability to awaken deep feelings in those who visit. While some use travel as a distraction, you can use travel intentionally, allowing your external journey to guide your internal one. Approach these sacred sites with an open heart and let their sanctity do the rest - you just might feel your spirit stir. Countless people report profound spiritual experiences in this buddhist shrine, undoubtedly the holiest place in all Bhutan. 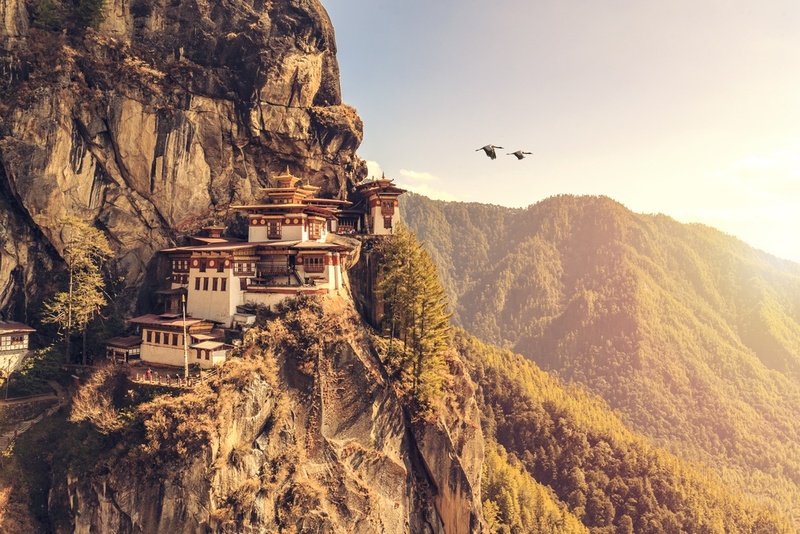 This site has been sacred since the 8th century when the great Guru Padmasambhava (sometimes called the Second Buddha) is said to have meditated in the cave for 3 years, 3 months, 3 days, and 3 hours. As legend has it, he soared here on a flying tigress and conquered the cave’s demons -- hence the name Tiger’s Nest. The temple, built in the 17th century, and rebuilt after a fire in 1998, clings to the bare cliffside beside a 200 meter tall waterfall. The 2 hour hike up a steep staircase weeds out many tourists, but offers dramatic views of the gorge below. Mount Kazbek holds a special significance in Georgian folklore -- after mythical hero Amirani stole fire from the gods to give to humans, he was banished to the top of this rugged mountain. In Mount Kazbek’s mountainous cradle, a lonely 14th century church rests atop a green hill, representing a convergence of traditional Georgian spirituality and Orthodox Christianity in this beautiful country in Eastern Europe. This church’s elegance lies in its simplicity, with its cobbled brick belltower kneeling in reverence to the spectacular mountainous expanse. You must complete a 2 hour trek to reach this sanctuary, but its isolation and all-encompassing quietude will both awe and humble you. Mount Kailash’s quiet power has changed the lives of almost everyone who have come to see it. This remote Tibetan peak is one of, if not the, holiest site for four separate religions -- Hinduism, Buddhism, Jainism and Bonism. Despite this, it is seldom visited. Indeed, getting here is a monumental challenge, with no public transport going to the region. However, if you manage to reach it, the sheer power of the world’s most mysterious mountain will floor you. Shiva's throne and Buddha Demchok, both representing supreme bliss, are said to reside here. This mountain has never been climbed, although pilgrims will trek the 32 mile path around it as part of an intensely spiritual ritual called the Kora. Pilgrims will also bathe in the nearby and highly sacred Lake Manasarovar, most closely translated to Lake of Consciousness or Enlightenment. Don’t let the the sinister (and inexplicably apostrophe-less) name fool you -- a journey here is sure to be uplifting and profound. In fact, the name “Devils Tower” is likely a misinterpretation or a slight to its non-Christian spiritual significance. A myriad of legends swirls around Devils Tower. The most prominent myth describes children fleeing from a bear to the top of the hill and praying; the Great Spirit responds by lifting the hill to form this great tower, with the bear leaving claw marks as it slid down the side. There are no rivers in the Yucatán, only cenotes, limestone basins or sinkholes which reveal groundwater beneath the earth. Cenote Sagrado is particularly impressive, with vines and vegetation pouring down its walls, reaching 89 feet (27 meters) down to the ground. In ancient times, Mayan pilgrims from far and wide traveled to Cenote Sagrado in order to give their offerings to Chac the Rain God, believed to live at the bottom. They also believed cenotes were an entrance to the underworld and used it to communicate with their ancestors. As a result, everything from jade, to gold, to human skeletons have been found at the bottom of Cenote Sagrado and other cenotes as forms of offerings. Undoubtedly, these were sites of human sacrifice in ancient times. These peculiar watery shrines have an ethereal spiritual draw, and have been attracting visitors for decades.